Do you want one of the best portable record players with speakers, USB, and a Bluetooth receiver in 2018? One that is the best buy on Amazon, eBay, or Walmart which you can easily purchase whether you are in the US, UK, or Australia? Record players are not extinct as would've been expected due to the advancements in technology that have brought about CDs and digital audio files such as MP3, MP4, etc. The grandfather of modern record players is Thomas Edison and he designed the first record player which is traceable to the year 1877. So. you can see how far these devices have come. Their popularity in 2018, can be attributed to the comforting sound they produce and their premium build that makes them an electromechanical device to own. Unlike decades ago where all they could do was play a record that was manually placed on the platter, modern record players now have a built-in Bluetooth as well as a USB and RCA output terminals. Much more, they can digitize records and automatically play or stop a record. If you're a lover of vinyl records, then you may be looking for the best portable record player to buy which will be easy to transport and maybe fit into a shelf. For this reason, we have chosen and reviewed some of the most portable turntables on Amazon that will allow you to have your vinyl record player close by irrespective of where you are. Their large size does not mean they have to be mobilized to one place since some are also briefcase record players that you can travel with. 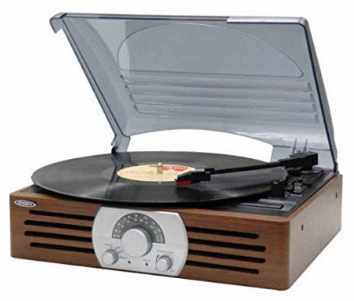 A record player is also called a phonograph or turntable and it is a music player that can recreate the sound recorded on a circular disc called a Vinyl record. This is device comprises of major components such an Amplifier, Turntable, and Speakers and each of these helps to create the sound you hear while the record is playing. Other components on this music player include a Stylus, phono cartridge, and tonearm all of which help to read the sound on the vinyl record which is reproduced by the amplifier and speakers. If you're wondering how record players work, here's a simple explanation. 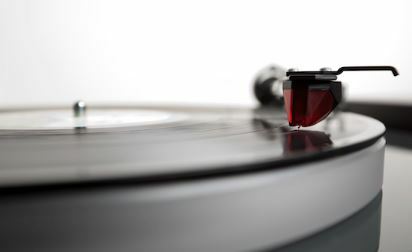 When you place a record on the platter or turntable, it begins to spin at a constant speed of either 33, 45, or 78 revolutions per minute (RPM). The speed at which the record is spun determines how fast the record is played and as such, this speed can be manually selected by the user. The vinyl record has an engraving of sound waves or undulations on its surface called the groove. As the record spins, a playback stylus placed on the groove reads these undulations and vibrates according to its pattern (peaks and valleys). These vibrations are then converted to electrical signals that are amplified before being sent to the speakers. And then you get the sound that is being heard. Some record players come with a USB port which allows you to connect it to a PC or Mac and then transfer the records. 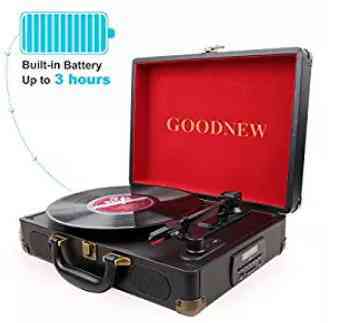 In the same vein, you'll find some of the best portable record players with Bluetooth which will enable you to connect them wirelessly to an Audio source such as an Android phone, iPhone, PC, and other Bluetooth enabled devices. Their headphone jack also allows for a connection to either an open back headphone or DJ headphone in order to get the best audio quality. Yes, they all go by the same name since they have the same functionality. But then, there are still some differences between a record player and a Turntable. A record player is a single unit that consists of a Turntable, amplifier, and speakers. On the other hand, a Turntable is not built with these other components and as such, you need to buy them separately.. Nevertheless, their names can be used interchangeably since a record player has a turntable and a Turntable can play a record. We hope we didn't confuse you there! 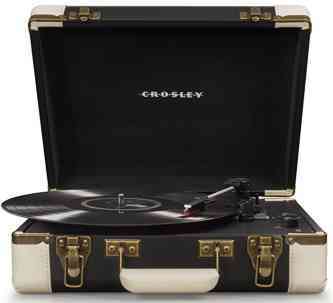 Most record players are portable and come in a briefcase build that will enable you to carry them easily. The same cannot be said for a Turntable which may also be portable, but suitable for being placed on a desk, table, or shelf. Admittedly, irrespective of their price and features, these turntables all have the aim of delivering high-quality sound. In a manual portable record player, you are required to lift the tonearm and place it on the platter before the record begins to play. When the record ends, you'll also have to lift the tonearm and place it back on its stand. A disadvantage with this configuration is that you can easily damage your record if your place the tonearm forcefully on it. Here, the tonearm is automatically moved and the stylus is placed on the groove of the vinyl record. Also, the tonearm is returned when the record ends. Other than these, there are different types of phonograph turntable drives and they include the belt-drive, direct-drive and Idler wheel. Most low entry, as well as high-end portable record players, have a belt drive. This type of drive uses an elastic belt to connect the motor to the platter and as such, the belt can absorb the motor vibrations. Consequently, this prevents the stylus from reading the vibrations which would've affected the audio quality. The disadvantage to this drive is that it does not record immediately at their selected speeds, but build up to the speed within a second. Also, they are not suitable for Djing since the elastic belt can break if the turntable is scratched on. Direct-drives are mostly used in record players for turntablism where the sound will be manipulated to create effects or new music. In this type of turntables, the motor is directly connected to the platter and as a result, the record does not have a slow startup time and can still play at a constant speed even when it is scratched. And unlike the elastic belt in a belt-driven turntable that may break if a record is scratched, these do not wear and tear easily. If you have some old records which were your grandparent's, you might want to transfer the sound to your computer. One way you can achieve this is with a record player that allows you to transfer sound via a wired cable connection to a computer. These devices also come with a software that will enable you to separate the record into individual tracks and store them in digital audio formats. To take a walk along memory lane to when you were a child, that's if you were born before the 90's, then a record player can be a mind booster. You can relive your childhood days in your head while you listen to your favorite songs playing. The comforting sound produced by these record players can be therapeutic. Vinyl records come with designs on their packs and because of that, you can show off your collections in your home or office. You can line them on the shelf, admire them, and also find people with similar interest when they walk into your home to comment on the records. Now if you have all these records, you'll definitely need a portable record player to use them. We spent several hours researching for the best portable record player with built-in speakers which you can buy in the US, UK, Australia as with several other countries. These are audio players that either come with a briefcase or have a small compact size that will enable you to move them around with ease. Other than their size, they also have admirable features that will provide you with the best audio quality. Many are still searching for the Audio Technica Sound Burger because it was an impressive piece of technology. Although its production has been discontinued, there are several other record players from Audio-Technica Corporation, a Japanese company that specializes in the design and manufacturing of microphones, headphones, phonographs and other audio equipment. 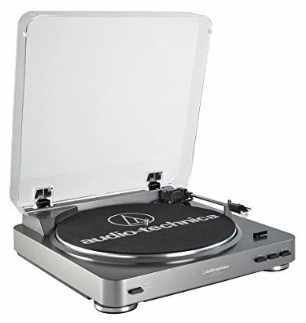 One of such is the Audio Technica AT-LP60 which is said to be the best portable record player of 2018. The AT-LP60 has a dimension of 14.06 x 3.82 x 14.17 in and weight of 5.3 lbs which translates into a portable device that can easily be moved around. It does not take up so much space on your table, hence it can fit in nicely with your home decor. This is in line with its premium and durable build that gives it a sleek design and you can either purchase this device in Black or Silver Color. To protect the Turntable from dust, this record player comes with a removable hinged dust cover. The AT-LP60 has an automatic turntable that automatically plays records placed on its platter and also stops spinning once it has finished playing. This is done by gently placing the Stylus on the record groove before playing and then returning the tonearm once the record ends. This will prevent your records from getting damaged easily as would be the of a manual turntable where you may forcefully place the tonearm on it. This is a portable record player under 100 dollars that supports two speeds settings which are 33-1/3 and 45 RPM. This will enable you to control the speed of the record to suit your needs. For its motor configuration, it features a belt-driven design which connects an elastic belt between the motor and the platter. Vibrations will be minimized and as such, you can expect a clear and high fidelity audio sound. This system uses an integral dual-magnet Audio-Technica phono cartridge with a diamond stylus that is replaceable. This means that you will be able to replace the needed if need be, but the same can't be said for the phono cartridge since it is built-in. This record player comes with a built-in switchable phono pre-amplifier with an RCA output that will allow you to enhance the sound by connecting via cables to an external sound system. Thus, if you're unimpressed with the sound quality, you can always boost it to meet your expectations. The Goodnew vinyl record player Turntable is one of the best portable record players under 200 dollars. This device is designed and manufactured by Goodnew, a company that was established in 2010 and now transports goods to Europe and America. This is a suitcase turntable player that is easily transportable from one place to another. It has a compact size which makes it easy to carry about and since that's why you may need this type of turntable in the first place, you'll come to love this Goodnew record player. It has a weight of 6.85 pounds, a dimension of 16.5 x 6.5 x 13 in, and features a handle all of which translates into a very portable turntable. The Goodnew vinyl record player comes with inbuilt speakers to produce high-quality sound. It also has a headphone jack and RCA output that will allow you to connect to a headphone and sound system respectively in order to get a more detailed sound. Once the record ends, the tonearm is returned to its position automatically which takes away the need for you to do it. But then, you will have to enable this feature by turning ON the Auto ON/OFF switch built into this record player. According to its maker, you can connect it wirelessly via Bluetooth to an audio source such as a Smartphone, Tablet, or PC to transmit sound that will be played through its speakers. To enable you to listen to the radio and switch between channels, this music player comes with a built-in FM radio. You can either place your vinyl record on its turntable to entertain yourself or switch on the radio. It might also interest you to know that this system comes with a built-in battery that can provide up to 3 hours of music play time. You can select between 33 / 45 / 78 RPM speed settings to determine the speed at which your record will be played. We've had people ask, "are Victrola record players good?" For their price tag and level of performance, the answer to that is yes. 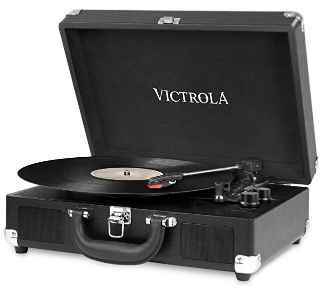 Here's one more portable turntable under 100 dollars that will give you a run for your money and that is the Victrola Vintage 3-Speed Bluetooth suitcase turntable with speakers. Victrola is the brand which started in 1906 and its record players are designed and manufactured by Innovative Technology, a company that has offices in New York, Europe, and Hong Kong. What's with the Vitrola Vintage? This is a briefcase record player that has been designed with a handle to make it easy to carry about. At a dimension of 16.65 x 7.28 x 12.8 inches and weight of 5.07 lbs, you'll agree that it has a compact size. You can move it around the house or office and take it along with you when you're on the move. Color options for this Turntable include Black, Gray, Aqua Turquoise, Pink, as well as ones a UK and US flag designs. As a result, if you want a portable suitcase turntable that matches with your home decor, look no further. The VSC-550BT-BK is a 3-speed turntable that supports 33 1/3, 45, and 78 RPM speed settings which will allow you to control the speed of the record. This is a portable record player with Bluetooth that will enable you to stream wirelessly from a Bluetooth enabled devices such as an Android or iOS phone, PC, Mac, or Tablet. That being so, even if you don't have any vinyl records lying around, you can start entertaining yourself with this record player thanks to this connectivity feature. Within a distance of 33 feet between your audio source and this all-in-one portable music player, the connection can be maintained. In line with that, its 3.5mm aux-in jack will enable you to play music from a non-Bluetooth device. To give a clear and crisp sound, you'll find two front-facing speaks built into this turntable. And to amplify sound with a sound system and headphone, you can connect them to its RCA jack and headphone jack respectively. The Jensen JTA-222 3-Speed Turntable is one of the most popular record players from Jensen, the others being the JTA-220 and JTA-230. These portable turntables are designed and manufactured by Spectra Merchandising International, Inc, a US consumer electronics company that has been in operation for about 40 years. Thus, if you want a reputable brand to settle with for your next turntable, this would be it. For a classy design, this turntable has a wooden case, hence if you're really looking for a reminder of your younger days of a wooden radio, television, record player, etc this would be it. Serving as a protection against dust and damages on its Turntable and internal components is a transparent dust cover. You'll find appropriate buttons to control this device as with a Power Indicator that notifies on the current system mode. In terms of build, its compact size has a dimension of 5 x 12.5 x 11 inches which makes it suitable to be placed on a shelf or table. The JTA-222 3-Speed Stereo Turntable comes with an AM/FM Radio to enable you to access your favorite stations. You do not have only a vinyl record to entertain you, but you can tune in to what's happening live around you. Speed settings that will enable you to control the speed of its turntable are 33, 45, 78 RPM. In this Turntable, are two speakers that promise to offer great audio quality and their front-facing placement makes for a more direct sound. To enhance the sound levels, you can connect a hi-fi sound system to this device thanks to its external RCA speaker output jack. The same can be said for its headphone Jack which can be used to connect a headset to it via a wired connection. For about $80, you can have a turntable from the reputable manufacturing company, Crosley Radio who has been designing machines like this for over 30 years now. This record player has a briefcase design, making it easy to carry it when you're on the go. It has a dimension of 14 x 5 x 12 in and a weight of 7 lbs that still gives it a portable size. 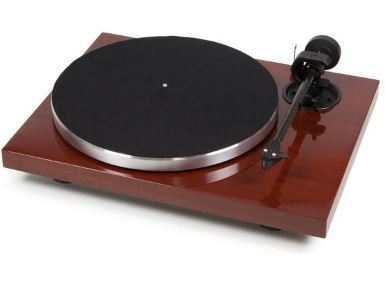 Its colorful and sleek design makes it a good choice for those in search of an affordable turntable with a stylish look. This is a portable record player with a Bluetooth receiver which makes it possible to stream music from your smartphone, Windows PC, Mac, Tablet, or other Bluetooth enabled devices through its speakers. You'll find dynamic full-range stereo speakers on this machine that can provide an appreciable audio quality. There is a knob that serves as a control for the record speed, allowing you to tune it to suit your needs. In line with that, speed settings supported are 33 1/3, 45, and 78 RPM (revolutions per minute). As with its wireless connectivity, it also supports a wired connection via USB cable to provide a means of digitizing your records. By plugging into its USB port and using the recommended software, you can turn all records into digital files. Unarguably, there are a lot of record players out from different brands featuring low to high-end specs. But then, some are more portable than others and this will ensure that your turntable does not stick to a particular place for a long time. You can change its location around the house and also travel with it if need be and most importantly, still get a high quality sound. For choosing turntables with a compact size, we considered their weight and dimension to ensure that neither do a weigh a ton nor are they extra large. Also, some of these music players come in a briefcase design featuring a lock and handle to enable you to transport them. Our selected record players have turntables that use a belt driven design where an elastic belt connects the platter and the motor. Here, the belt as acts as a shock absorber that prevents vibration from reaching the platter and as such this configuration helps to prevent internal vibrations from tampering with the sound quality. While portability may be your first priority, it is also important to have a record player that can either connect wirelessly via Bluetooth or via a Wired cable connection. The former will enable you to stream digital files to the turntable's speakers while the latter will enable you to digitize your records using a PC. The turntables we've reviewed either come with one of these or both. They also have an RCA output as well as a headphone jack that will enable you to connect it to an external speaker. These products were selected from Amazon and as such, we could use the reviews of buyers to determine their real-life operation. In this case, we looked out for their durability and sound quality to ensure that the turntable you get can stand the test of time while giving you a decent audio quality. So, these are the most portable record players with speakers, USB port, as well as a Bluetooth receiver. You can use them with your vinyl records and expect a good audio quality. Much more, these are all budget-friendly Turntables that do not require that you rob a bank to procure them. Now it's your turn to go out there and buy one of these in order to enhance your level of entertainment at home, office, or business.